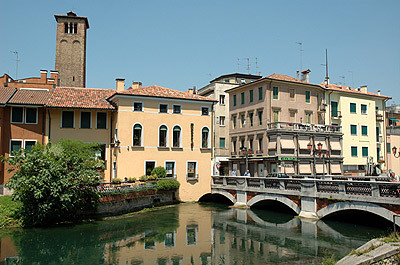 Situated on the North bank of the Sile River, between the branch of the River Botteniga (in the so called branches of the Cagnan di Mezzo, also called dei Buranelli, and the Roggia), Treviso began its history as a Paleoveneto settlement, becoming Romanized in ’89 BC, then later the “Municipium Tarvisium,” with the classic trim town planning positioned on the Cardo (the present day via S.Margherita, Indipendenza e Calmaggiore) and the Decumano (present day via Martiri della Libertà). It was a flourishing centre under the Goti and Longobardi. In 776, Carlo Magno declared it a County. The true economic renewal, came about after the year 1000 and in the 12th Century, the City was constituted as a Free Council, recognized by the Emperor Barbarossa in 1168 and from the Pace di Costanza (Peace of Costanza) in 1183: in this period, the Communal Buildings were erected, known today as those situated in Piazza dei Signori, as well as the first defensive walls. Between the 13th and 16th there was an unstable political structure, until the definitive transition under Venice in 1388. Nevertheless, it was still a prosperous period, with a University, frequented by literary men and artists of great esteem: Dante stayed in Treviso, as well as the great artist Tommaso da Modena. During this period, the urban face of the city was outlined, characterized by the interlacing of the angled roads, and of the water and green areas. Between 1400 and 1500, Treviso continued its phase of growth, both from an artistic and economic point of view. In 1520, the walls were finally completed, which today, still surround the historical centre of the city: an exceptional example of Renaissance engineering, but one which marked from that moment, the slow, yet inexorable decline, which prolonged into the 1800’s. Treviso was heavily hit during the 1914/18 war, but above all, suffered a disastrous aerial bombardment in the Second World War, which destroyed and damaged a large part of the historical centre, then wisely restored. Thanks to the activity of its Communal Theatre – splendidly restored today – and the presence of those authors like Comisso and Parise, together with artists like Arturo Martini and Gino Rossi, and finally of architects Carlo Scarpa and Toni Follina –not forgetting the projects of Mario Botta – and cultural personalities like Giuseppe Mazzotti, Treviso gained a place in the cultural history of 20th Century Italy.